Your host and guide is MIKE ROSS…your local guide to the world, since 1982. Includes accommodation with private bath; BREAKFAST AND DINNER DAILY, all transportation in and between London and Paris. Features: LONDON with the TOWER OF LONDON, BIG BEN, BUCKINGHAM PALACE, PICCADILLY CIRCUS, WESTMINSTER ABBEY, TOWER BRIDGE, THAMES RIVER, THE NATIONAL GALLERY OF ART, THE BRITISH MUSEUM and OXFORD STREET; the CHUNNEL TRAIN to FRANCE; PARIS with the EIFFEL TOWER, SEINE RIVER, NOTRE DAME CATHEDRAL, the ARC D´TRIOMPHE, the CHAMPS ELYSEE, the LOUVRE MUSEUM, the LEFT BANK, the artist´s quarter of MONTMARTRE and SACRE COEUR CATHEDRAL. ADD 4 DAYS IN PROVENCE AFTER THIS TOUR FOR “LONDON & PARIS & PROVENCE” AND SAVE. SEE BELOW. This is a LEISURE TOUR from ONE hotel. Unpack only once and ENJOY! Take time to savor the culture you are in, spend a quiet afternoon in a sidewalk cafe, visit a bustling market, explore neighborhoods and museums of your choice, browse boutiques and tiny shops and enjoy the atmosphere of European living. All LEISURE TOURS will include airport transfers at the destination, superior hotels with private bath in a central location, breakfast and dinner daily, ETCS Travel Preparation and Sightseeing Documents, and myself as guide/translator. MAXIMUM NUMBER OF TRAVELERS IS ONLY 14. Day 1. Board your transatlantic flight. Day 2. Arrive in LONDON! 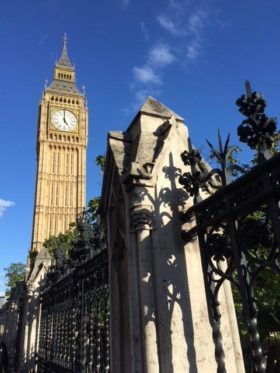 We will see the HOUSES OF PARLIAMENT, BIG BEN, the Churchill Statue in Parliament Square, the London Eye Ferris wheel, the Thames River, Victoria Station, Parliament Square, St. Margaret’s Church, Westminster Cathedral and WESTMINSTER ABBEY. Overnight London. Day 3. 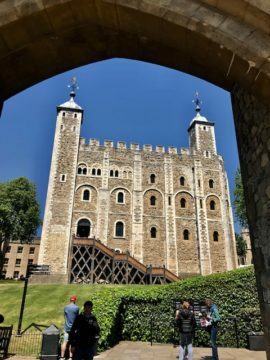 We begin today with a visit inside the TOWER OF LONDON, the very essence of English history and see the Tower Bridge and the HMS Belfast across the Thames. Later we visit Trafalgar Square and the National Gallery of Art. This evening you may wish to attend the theater, always a London highlight. Overnight London. Day 4. This morning we view the BUCKINGHAM PALACE and find out if the Queen is in residence. Later we visit the BRITISH MUSEUM to see the Rosetta Stone and the Great Arm of Ozymandias (Ramses II). Afterward we’ll stroll down to Covent Garden where “My Fair Lady” began. This afternoon you may wish to visit the Tate Modern Museum or just do some shopping along Oxford Street. Overnight London. Day 5. An early morning train whisks us under the English Channel to PARIS, City of Light. This afternoon we visit NOTRE DAME CATHEDRAL and take a walking tour along the Seine to the Left Bank. Overnight Paris. Day 6. We begin the day with a visit to the LOUVRE MUSEUM, one of the most famous art museums in the world. Later we stroll along the elegant Champs Elysee up to the ARC D´TRIOMPHE and the Tomb of the Unknown Soldier. You may wish to spend this afternoon at the Pompidou Museum for modern art or the Musee dÓrsay, famous for its impressionist paintings. Overnight Paris. Day 7. 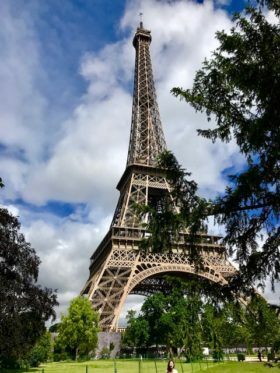 Today we view the EIFFEL TOWER, symbol of Paris itself. 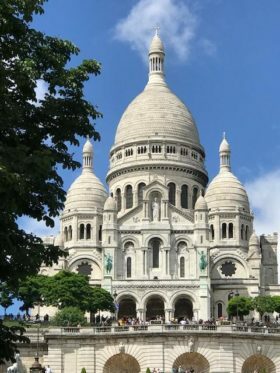 Later we will go up to the artist´s quarter, MONTMARTRE, and also visit the SACRE COEUR CATHEDRAL. Shop on the Left Bank this afternoon or stroll along the Seine and pick up some great art posters. Overnight Paris. Day 8. Transfer to the airport to board our transatlantic flight back to the USA or continue to PROVENCE! LAND PRICE per person sharing a room $3699 per person sharing, $3299 with early deposit; for MIKE ROSS TRAVEL returning travelers only $2999. Single supplement $599. AIRFARE AND TAXES NOT INCLUDED. PROVENCE addition only $ 1199 per person sharing a double room. PAYMENTS: $1500 p/p deposit with REGISTRATION FORM on website. Make check payable to ETCS, Inc., 922 Oak Grove Road, Jackson MI 49203. Balance due 90 days prior to departure. See TERMS & CONDITIONS on the web site. Call Mike at 517-782-6847, toll free 877-845-4763, send an e-mail to Mike@mikerosstravel.com or visit us on the web at www.mikerosstravel.com.